All aspects of our bespoke bench seating can be fully customised to suit the customer's requirements, from the construction of the frames to produce the desired ergonomic affect, to the finest detailing and finishes. At Atlas Contract Furniture, we have an extensive range of custom bench seating for both large and small venues. We can work with your interior designer or provide our own to find the perfect style, colour and fabric for your venue. We are experts in creating the style and mood that you want, helping you to make a bold statement for your business. Choose from our unique range of designs and eye catching finishes and upholstery to give you indoor bench seating that provides complete customer comfort and satisfaction. 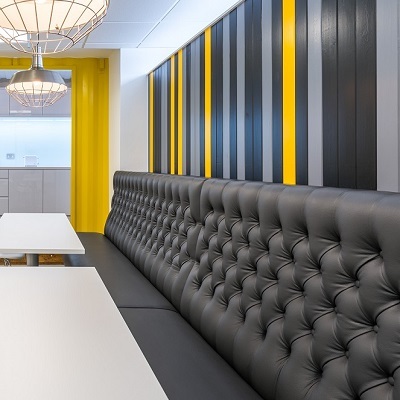 From traditional to individual themed designs, plain back to fluted back, button back to square panel, our bench seating is manufactured to the highest quality and safety by a dedicated in-house team of specialists. 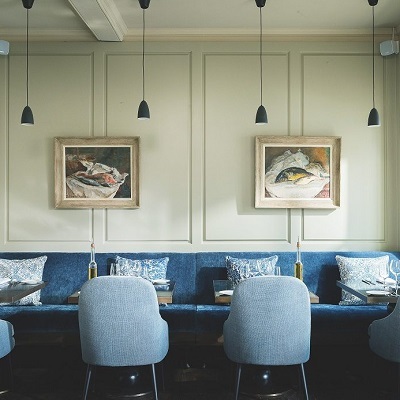 Booth seating is where a table and seats, usually with high backs, create a comfortable partitioned area in a venue, like a restaurant, cafe or pub. We are a specialist at manufacturing booth seating. We have a team of designers, carpenters and upholsterers who work together to create the style and ambience that you want. Our booth seating is manufactured to the highest quality. Choose from a wide range of designs, finishes and fabric options to give your seating individuality, style and comfort. It’s the finishing touch for all furniture and you’ve got to balance the aesthetic with cost and durability. Make the right choice for your business by working with furniture experts who specialise in supplying the hospitality industry. 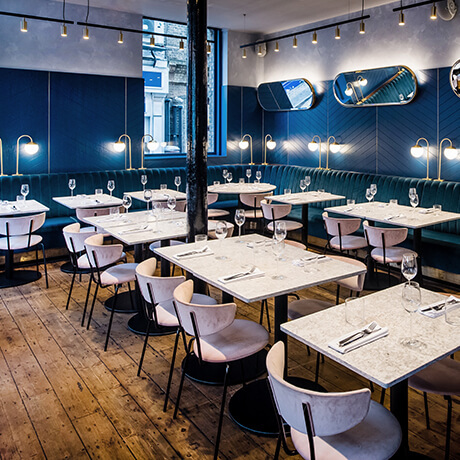 We work with clients in the UK and Europe to design banquette seating that embodies the look and feel of their restaurants. 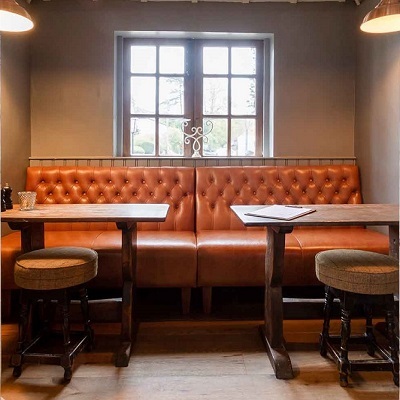 We manufacture specialist seating for bars and pubs that are comfortable, stylish and, most importantly, durable. Whether it's booth or bench seating, we design and build furniture to fit your cafe's space and unique style. 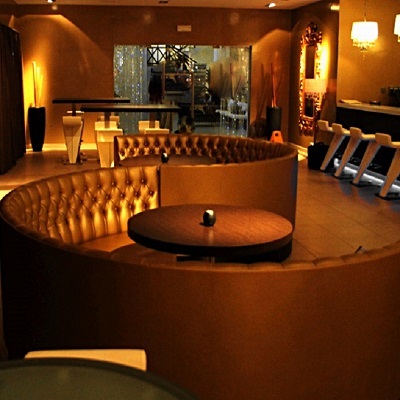 Bring style and class to your nightclub with bespoke seating designed for comfort and durability so that it keeps looking great through everyday use. Keep impressing your guests with stunning seating. Our banquette seating is custom made for your hotel, creating a welcome and relaxing space for your guests. 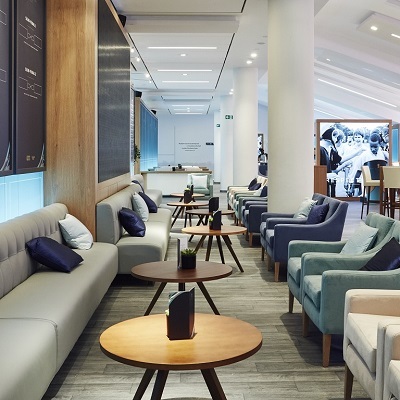 We provide seating for numerous commercial sectors, such as the marine industry, so whether you need a break-out area or waiting room, we're happy to help. Look familiar? We’ve worked with popular establishments across the UK and further afield to deliver bespoke seating and other further items for many years. Have a browse through some of our projects to get an idea of what you can achieve for yours. 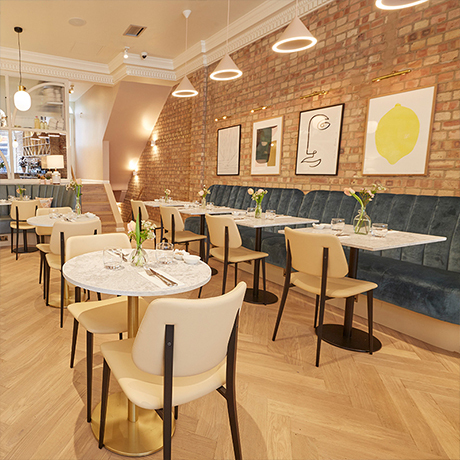 Whether it’s bench seating for a restaurant, booth seating for a pub or banquette seating for a bar, we can provide a range of contract seating to meet your requirements.